You may have heard that pastels and oil pastels are in the same category. The difference is in the binding agent. 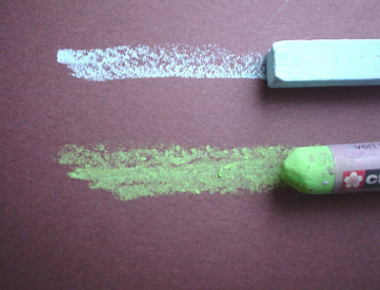 Both mediums are pigments in stick form. They are bound together using mineral oil and a bit of wax, whereas in chalk pastels the binder is gum tragacanth. 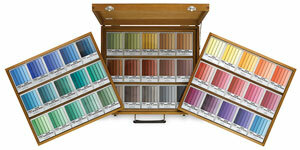 Because they have more binder than pastels, their colors are not as vibrant. They are a relatively new medium; first put on the market in the sixties. My first memory of using them goes back to my elementary school art classes in the 70's. Instead of using crayons like many children in the U.S. do, we used the Japanese-made Sakura brand. They came in numbers varying from 8 to 24. I remember their oily, buttery feel. I assumed that all school children used them until I had my own children. Then I discovered that nowadays they use crayons, which are not at all the same as those I used. In retrospect, I am glad I was exposed to this medium early on. I did not use them much as an artist until I become very proficient with oil paints and pastels. I picked them up again some years ago, after I saw an artist who had incorporated them into his oil paintings. The oil pastels really shone on his paintings, and I was intrigued. I bought a full set of Holbein Artist's set (there are 225 sticks) and fell in love with them. They have been an integral part of my art ever since. They are a highly versatile medium, and you can adapt it to many styles. 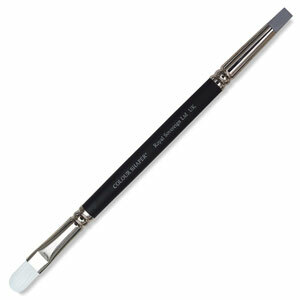 I use them on top of dried oil paints, watercolors, charcoal, and pencil drawings. If you do mixed media, then you can't afford not to use oil pastels. Compared with pastels, they are dustless. You can breathe without worrying about inhaling the dust. They are easy to set up and clean. Get them packed in boxes and you are ready to go. I often use them for my outdoor painting. Just be careful not to expose them to extreme heat otherwise they will melt. If you leave them sitting in your car, you may find a molten mess when you get back. You do not have to frame them with glass like you do with pastels. I have broken too much glass when framing pastels for shows or transporting them to galleries. Also, I do not like the idea of putting art behind a barrier. They allow you a more direct visual experience—similar to other media like oil paints or encaustic. Can they smear? Only if you rub them aggressively. But why would you do that intentionally? If you are stacking them, just cover them with wax paper, and it should be fine. There is no need for fixative to 'fix' your paintings. You can build layers and layers of pigments without having to spray between layers. If you want to use a fixative anyway, Sennelier manufactures one just made for them. It's good for making a stick harden faster. I prefer not to use it so I can come back to make changes in my paintings.